This entry was posted on	2011 Nov 7 at 11:00 am	and is filed under Stage One. Fun! You’re digging on the “table full of dice” designs at the moment. I would love to put a map of the room you’re playing in on the table, with the position of the thrown dice corresponding to appropriately sized ‘stuff’ in that position of the real-world room. As levels expand, the map on the table can be resized to represent your house, your neighbourhood, your suburb. 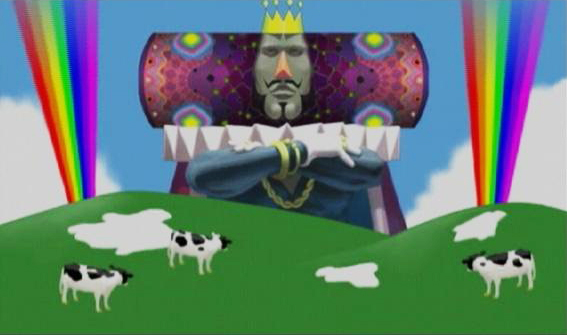 Also: I love Katamari Damarcy. Love it. If this game works, I’ll love it too. And if it can incorporate the dysfunctional relationship between the King and the Prince then it will be frickin’ awesome. This is so simple and yet…so smart. Imagine a house con, with people playing games in every room. In one room, there’s a disco ball & colored lights flashing, the soundtrack of Katamari Damacy is playing, and a perpetual, drop-in drop-out game of All Cosmos is being played. There’s also a bar serving only cosmopolitans. You guys are beating me to it! I’m going to review my own game first, as an example of the invitation process, and some of this stuff is what I was planning to say! Heh. It just occured to me that if you wanted to, you could pitch this as ‘the tidying game’. Parents can use this as a game to convince their kids to pick up stuff off the floor really quickly! Played a game. Music is essential. We didn’t have that many dice, so every time we advanced a die size we rolled our collected dice back in. It was a cool way to make sure the board gets repopulated with dice and is kind of a catchup mechanic for the losing player, because the easy dice get thrown back in. Robert: I’m psyched that you played it! Do you feel like my comments and criticism in my review post matched with your experiences? Would those suggested changes have made it more fun, do you think?